Since we started working with the Boykin Spaniel Society (BSS), both Paw Print Genetics (PPG) and the BSS have learned much about the genetic disease concerns of these wonderful, little brown dogs. By using the founder breeds of the Boykin as a guide, PPG developed the first Boykin spaniel inherited disease testing panel in 2014. Based upon the results collected over two years of testing Boykins, in September 2016, the original disease testing panel was split into two panels; the Boykin spaniel essential panel (containing the most clinically important and/or common diseases) and the supplemental panel (containing diseases of less clinical importance and/or lower incidence). 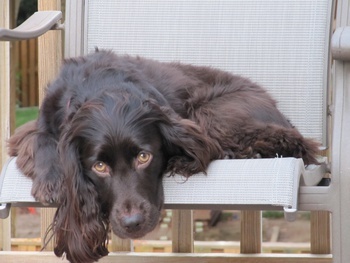 Two of the four diseases on the Boykin spaniel essential panel are inherited diseases of the eye. Diseases resulting in vision loss or blindness are among some of the most life-altering and troublesome non-lethal diseases of dogs. However, with knowledge of a specific genetic mutation resulting in blindness as well as an understanding of how that specific eye disease is inherited, blindness caused by the mutation can be prevented through the use of genetic testing and informed selective breeding practices based upon test results. Two eye diseases known to be inherited in the Boykin spaniel are collie eye anomaly and a form of progressive retinal atrophy known as cone-rod dystrophy 4. Progressive retinal atrophy (PRA) is a group of inherited eye diseases in dogs marked by gradual degeneration of the retina, resulting in blindness. Over a dozen forms of PRA, caused by different mutations in various genes, are known to occur in dogs. Though each form of PRA has similar clinical signs related to retinal degeneration, the inheritance, age of onset, and speed of progression can vary between PRA types. Dogs affected with PRA typically display changes in the structure of the retina that can be identified on eye exam, prior to the dog showing signs of vision deficits. These changes include thinning of the retina and retinal blood vessels as well as an increase in reflectivity of light from the part of the eye known as the tapetum; the reflective part of the eye responsible for improving a dog’s vision in low light settings and for the “eye shine” seen when you shine a flashlight in your dog’s eye or take a photograph with a flash. Paw Print Genetics found a mutation of the canine RPGRIP1 gene in Boykin spaniels that was previously associated with a form of progressive retinal atrophy known as cone-rod dystrophy 4 (PRA-crd4) in other breeds. PRA-crd4 has a variable age of onset and has been reported in dogs between one and 15 years of age. Progression of this form of PRA tends to be slow, but most affected dogs (especially those with an early age of onset) will progress to complete blindness. PRA-crd4 is inherited in a recessive fashion, meaning that a dog must inherit two copies of the mutation (one from each parent) in order to be affected. However, this disease also displays a phenomenon called incomplete penetrance, meaning that not every dog that inherits two copies of the mutation will go on to develop disease. Dogs inheriting a single copy of the mutation are considered “carriers” of PRA-crd4 and will not display signs of the disease themselves. However, carriers of PRA-crd4 can produce affected dogs when bred with another carrier of the same mutation. Therefore, in order to prevent producing affected puppies, it is important to only breed PRA-crd4 carriers to dogs that have not inherited a copy of the same mutation (“clear” dogs). It should be noted, however, that approximately half of the offspring from breeding a PRA-crd4 carrier to a dog clear of PRA-crd4 will be carriers of the mutation. In general, it is not recommended to breed affected dogs if you wish to eliminate the mutation from your blood line. In addition to identifying non-symptomatic carriers of PRA-crd4, genetic testing is crucial to identify affected dogs that have not yet begun to show clinical signs of disease. As an important aside, a test for a common and widespread mutation associated with a different form of PRA known as progressive rod-cone degeneration (PRA-prcd) was included on the original PPG Boykin spaniel panel in 2014 based upon reports describing the mutation in the cocker spaniel and the Chesapeake Bay retriever; two of the founder breeds used to create the Boykin spaniel. However, this mutation was not identified in more than 200 Boykins tested at PPG through September 2016. Thus, indicating that the associated mutation is likely rare (or absent) in the Boykin spaniel. For this reason, the test was moved to the Boykin spaniel supplemental panel. Because it is possible that this mutation exists in a small percentage of the Boykin spaniel population, the test is still an available option for testing Boykins in which there is a concern about PRA. Out of all of the disease-associated genetic mutations we have identified in the Boykin spaniel, the mutation associated with collie eye anomaly (CEA) has been found in the highest frequency in the dogs tested in our laboratory. However, during my conversations with Boykin breeders, I have found that there is some confusion about CEA in terms of its age of onset, progression of disease, and what inheriting the mutation means for a given individual. It is important to understand the nuances of CEA to lessen the confusion about this disease. CEA is a developmental disease of dogs which is present at birth (congenital) and caused by a genetic mutation in the canine NHEJ1 gene. Like PRA-crd4, CEA is inherited in a recessive fashion and the same breeding recommendations for PRA-crd4 apply to CEA in terms of breeding carriers or affected dogs. However, it should be noted that CEA displays a slightly different phenomenon than PRA-crd4 known as variable expressivity in which there is significant variability among individuals in the severity of clinical signs associated with the disease. Therefore, in addition to identifying non-symptomatic carriers of CEA, genetic testing is crucial to identify only mildly affected dogs. Though dogs with two copies of the NHEJ1 gene mutation are born with CEA, variability in disease severity makes genetic testing an important part of eliminating this disease from blood lines. Dogs affected with the “classic” presentation of CEA suffer from underdevelopment of a part of the eye known as the choroid (giving CEA its other commonly used name, choroidal hypoplasia). The choroid is the layer of tissue in the eye containing blood vessels important in providing oxygen and nutrients to the retina. This malformation of the eye results in the clinical signs associated with CEA. Dogs with severe CEA are typically easy for a veterinarian to recognize on an eye exam due to the presence of one or more common disease characteristics, often resulting in vision deficits or complete blindness. These include retinal folds, abnormal blood vessel structure, retinal detachment, hemorrhage in the eye, or malformation of the retina, optic disc, or white of the eye (coloboma). Dogs with mild clinical signs of CEA may be more difficult to diagnose on eye exam due to the normal process of pigmentation of the retina which occurs in puppies by 12 weeks of age. After 12 weeks of age, retinal pigmentation can mask mild clinical signs of CEA, making it difficult or impossible to identify the disease on an eye exam. This phenomenon, which many breeders refer to as “going normal”, is very important for breeders to understand because dogs examined after 12 weeks of age may be affected with CEA, but lack any obvious structural or vision problems. It is also important to note that mildly affected dogs can still have severely affected puppies when bred. In addition, affected puppies within a litter may vary in the clinical findings. If you have additional questions or concerns about PRA-crd4, CEA, or the other five inherited disease tests offered at PPG for the Boykin spaniel, please feel free to contact the Paw Print Genetics laboratory (509-483-5950 or AskUs@pawprintgenetics.com) to speak to one of our veterinarians or geneticists.